Playing a round of paintball with your friends is incredibly fun and exciting. Where you play can make a real difference when it comes to your overall experience. There are outdoor and indoor fields available in the state. 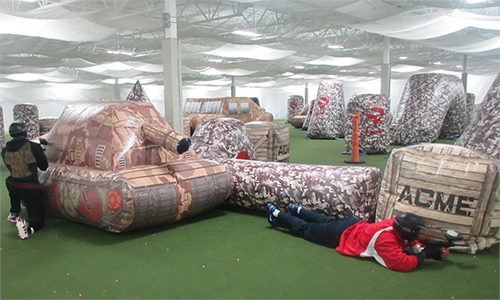 You should know the main differences between outdoor and indoor paintball in Minnesota. WeatherOne major differences in Minnesota is that indoor fields are not affected by the weather. If you were in an outside course, then anything from rain and high winds to snow could ruin the entire match. The indoor field at Air Assault is completely protected so that you can play paintball whenever you want regardless of the weather outside. A big difference between outdoor and indoor paintball is safety. Outdoor paintball courses are often filled with trees, hard obstacles and other features that could easily cause serious cuts. Someone could fall and be cut by debris on the ground. You are going to be much safer playing indoor paintball in Minnesota. Everything is controlled so that the floor and obstacles will not cause any harm while you are enjoying an intense game of paintball. This is the perfect environment for first-time players who are still getting the hang of the game. Something to consider is the difference in temperature between an outdoor and indoor field. It can become very unpleasant to engage in paintball wearing all your gear if it very hot outside. It is impractical to play paintball during a cold Minnesota winter day. The indoor field at Air Assault is fully climate controlled so that the temperature and humidity are always comfortable. This will make it easier to enjoy your paintball match. One final advantage that comes mainly with indoor paintball in Minnesota is the convenience of nearby concessions and amenities. Everything you need is within the facility just steps from each other. You can get a snack, supplies or use the bathroom without walking very far. This is not always the case with outdoor fields.